Airport Pickup and Drop . One full Day Kathmandu Heritage Guided Sightseeing . (English/French/Hindi and Spanish Language). 3 Nights Sharing (Twin) Accommodations on 1 star Hotel in Kathmandu on Bed and Breakfast Basis. All Applicable Government Value Added Taxes, Service Charges. 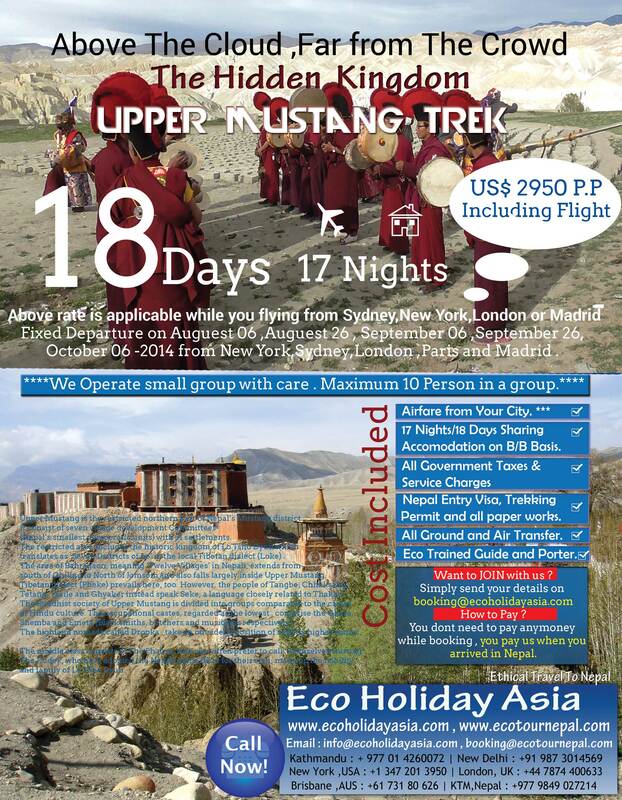 For online booking go to http://ecoholidayasia.com/ and book online , when Check out Please enter promo code ECOKTM652014 and check the payment option upon Arrival. Head office directly to Kathmandu, Nepal : +977 01426 0072 ( 9 am to 9 Pm GMT + 5:45 ) , +977 984 9027214 ( 24 Hour / 7 days) . 3 Nights Sharing (Twin) Accommodations on 1 star Hotel in Kathmandu and 1 Nights in Pokhara on Bed and Breakfast Basis. Special Trekking permit, government paperwork . Pokhara Jomsom Pokhhara by Air and other transport by Land . Tea House Accommodations during trek on B/B Basis . Emergency rescue (if need) by helicopter , Free of cost arrangement , charges will pay by your insurance company. Insurance , wages and other cost of team members . For online booking go to http://ecoholidayasia.com/ and book online , when Check out Please enter promo code ECOKTM262018 and check the payment option upon Arrival***. 8Head office directly to Kathmandu, Nepal : +977 01426 0072 ( 9 am to 9 Pm GMT + 5:45 ) , +977 984 9027214 ( 24 Hour / 7 days) . For This trek you must have to pay your flight tickets in advance and balance amount you will pay on arrival . Upper Mustang Pony Ride / Upper Mustang 4wheel Drive Option also available . ***This packages subject to availability of Air seats . Sightseeing in Kathmandu Durbar square , Patan Durbar Square and Bhaktapur Durbar Square. Pick up from hotel and drop in Hotel. Two departure daily morning for Sunrise (4:30 am) from Thamel and Evening 1 Pm From thamel .